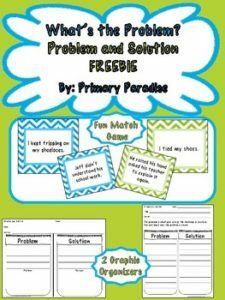 If you’re teaching problem and solution to your elementary class, you’ll love this freebie pack! It contains a problem and solution matching game and two graphic organizers! Check out this short video on how I teach problem and solution in my classroom! If you’d like to see how I teach problem and solution, check out this blog post! As always, my goal is to make teaching a breeze. I would appreciate feedback on this freebie!